Stand with Standing Rock is a grassroots social justice movement that began in North Dakota, United States. The movement began as activism against the Dakota Access Pipeline that was rerouted through Native American lands, in particular, the Standing Rock Indian Reservation. It began as a fight to protect sacred lands and the peoples’ right to water quality - as the pipeline is routed through the tribe’s water source. The pipeline disturbs sacred sites, infringes on past treaty promises and tribal sovereignty, and is a significant danger to water supply. However, the Stand with Standing Rock has taken on larger significance as a conduit for global climate change. The Standing Rock Indian Reservation is a Hunkpapa Lakota and Yanktonai Dakota Indian reservation in North Dakota and South Dakota in the United States. The Great Sioux Reservation spans across South Dakota west of the Missouri River, including the sacred Black Hills and Missouri River. The Standing Rock Sioux Tribe stands by its right to self-government as a sovereign nation, which includes taking a government-to-government stance with the states and federal government entities. Having signed treaties as equals with the United States Government in 1851 and in 1868, which established the original boundaries of the Great Sioux Nation, the tribe asserts these treaty rights to remain steadfast and just as applicable today as on the day they were made.
. As a result of this unwavering support, activists and native groups from across the country began arriving to a camp set up in North Dakota near the Standing Rock Sioux Tribe's reservation. Sept. 3, 2016 marks the first active protest (see: Strategies and Tactics). On September 9 2016, U.S District Judge James Boasberg rejected the Standing Rock Sioux Tribe vs. US. Army of Corps Engineers case and provided a ruling with no explanation for this decision. . After this ruling thousands of people gathered at the Standing Rock Indian Reservation to protest over the Dakota Access Pipeline. Ultimately, the court ruling was a catalyst for protests to occur in the form of peaceful marches and rallies all throughout United States and globally. Vision Statement “Standing Rock Tribal Government strives to be a more effective, efficient, and visible government providing opportunities for our economy to grow through business development by educating our members, to enhance the health and wellness of the people of Standing Rock”. Mission Statement “The Standing Rock Sioux Tribal Council is a governing body empowered by the SRST constitution committed to promoting an environment for the self sufficiency for all tribal members. One of the most well known Native American historical figures, Sitting Bull or Tatanka Iyotake, was from Standing Rock, the Hunkpapa band. . Sitting Bull was a leader of the people and a medicine man. Sitting Bull fought the American government to keep them from buying land sacred to the Dakota and Lakota people and to keep his people from being relocated to the Sioux reservation. On December 15th, 1890 Sitting Bull was killed while he was being arrested. Sitting Bull is memorialized in two burial places, one in Fort Yates, North Dakota and the other in Mobridge, South Dakota. . The land allotted to the Great Sioux Reservation was enlarged, from the Big Horn Mountains in the West to the East side of the missouri river. In 1889 Congress once again reduced the land of the Great Sioux Reservation. The land was divided into six separate reservations 160 acre lots. These reservation boundaries, as set in section 3 of the March 2nd 1889 act, are still the same today. Under this act the Reservation now became open for non Sioux to settle. On April 24th 1959 the constitution of the Standing Rock Sioux tribe was approved by the Tribal Council. The Tribal council is made up of a Chairman, Vice- Chairman, a Secretary and fourteen Councilmen. The Councilmen are elected by the members of the tribe. As a sovereign nation, the Standing Rock Sioux people have the right to self-govern. The Standing Rock Sioux Tribe are equals the the United States government, due to the treaties that were signed in 1851 and 1868. The Standing Rock Sioux people should maintain command of all the land and anything within it including waterways. . The land of the Great Sioux Reservation was never surrendered in any way to the government. On April 29th, 1868 in article 2 of the Treaty of Fort Laramie the boundaries of the Great Sioux Reservation were created. The boundaries are the 46th parallel of the north latitude then to the east bank of Missouri river, south of the nebraska line and west of the 104th parallel. Most of South Dakota is apart of the Great Sioux . The Standing Rock Indian Reservation is the fifth largest in the United States, covering 2.3 million acres. It is named standing rock due to the rock formation that appears to resemble a women with a child on her back..
Dakota Access, LLC (commonly referred to as “DAPL” or “Dakota Access”) is a company of Energy Transfer Partners is proposing project to transport American crude oil from the Bakken/Three Forks formation is North Dakota to markets and refiners located in the Midwest, East Coast and Gulf Coast regions in the United States. The 1,172-mile, 30-inch diameter pipeline is designated to connect the oil-rich Bakken and Three Forks production areas in North Dakota to Patoka, Illinois. The pipeline tansport approximately 470,000 barrels of crude oil per day with the highest capacity of 570,000 barrels per day or more. The project was originally scheduled to be in service by the fourth quarter of 2016 according to daolpipelinefacts.com, but the projected has had to postponed due to controversies it has had regarding the environmental risks and violations of the landowner’s rights. The oil potential in Bakken is massive. An estimated 7.4 billion barrels of undiscovered oil is believed to be in its US portion, according to the US Geological Survey. Energy Access Partners argue that after completion of the project with the transport of 470.000 barrels of crude oil is enough to make 374.3 million gallons of gasoline per day. said. The U.S. is the third largest producer of crude oil and its the number one customer in the world. In the spring and early summer of 2016, Allard along with other Standing Rock Sioux leaders reached out to neighboring tribes and domestic media for attention and aid. Hundreds of people responded to their requests; what started out as a influx of supporters, hastily increased into thousands,quickly overcrowding the Sacred Stone Prayer Camp. The overflow stemmed the creation of the Oceti Sakowin and Red Warrior Camps on the other side of the Cannonball river. On October 24th, over 200 protesters and tribal members set up a larger winter camp directly on the path of where the oil pipeline would be constructed, which is also the property of Energy Transfer Partners. In response to the creation of the new camp, over 127 arrests were made, and the Morton County Sheriff’s Department announced they were bringing in more deputies from other states to assist in controlling the protest. The Dakota Access Line Protest is not funded by any governmental organizations or major corporations. Resources and amenities have been supplied by supporters of the movement and protesters themselves. The Sacred Stone Prayer Camp has launched an official GoFundMe which they have stated in the description will go toward blankets, food, water, etc. The Standing Rock Sioux were soliciting donations from supporters through a paypal account for bail of protestors and emergency services. A legal defense fund was also created by protesters to fund the legal bills and ramifications of the demonstrations. The first North Dakota Pipeline Protest is reported to have erupted early Friday on April 1, 2016 in response to he 3.4 billion dollar Dakota Pipeline Project. Hundreds of tribal members from several Native American Nations took to horseback to protest against the construction of the oil pipeline. For months following, peaceful acts of civil disobedience were carried out against the Dakota Pipeline project, with no major news national outlets reporting the demonstration. Small online networks picked up the story but provided no substantial coverage. The protests finally gained traction in August, as 2016 presidential candidates, Bernie Sanders and Jill Stein voiced their opposition against the Dakota Access Pipeline. Senator Sanders released a statement on his website condemning the “dangerous pipeline” and announced his solidarity with the Standing Sioux tribes. With his public denouncement of the project, thousands of Sanders’ supporters took to social media protesting against the pipeline. Jill Stein, presidential nominee for the Green Party in the United States, voiced her allyship with DAPL protestors and appeared on site in North Dakota amidst hundreds of other protesters to partake in civil disobedience. In August 2016, youth of the Standing Rock Indian Reservation formed a group called ReZpect Our Water. The objective of ReZpect Our Water was to collect signatures opposing the Dakota Access Pipeline and run from North Dakota to Washington DC to deliver the petition to the president.The youth held several rallies in major cities such as New York City along their journey to Whitehouse. Eventually a social media explosion occurred as activists, protesters, and supporters trended the hashtags “NoDAPL,” “Water is Life,” and “Standing Rock” on Facebook, Twitter and Tumblr. SA viral Facebook reported that law enforcement officers were actively using Facebook’s geo-tag to seek out and arrest protesters, although unconfirmed and suggested to be a hoax by many journalists, hundreds and thousands of Facebook users checked in at Standing Rock in North Dakota to show their solidarity and support. However, national coverage was gained after photos and footage released by journalists and protesters on site displayed armed military guards equipped with water cannons sitting atop armored tanks advancing towards protesters on horses. Amy Goodman, an American broadcast journalist for Democracy Now! was arrested for filming footage of security officers working for the pipeline project using pepper spray and dogs on protesters. As tensions became more and more strained, violence broke out at Standing Rock; according to Standing Rock officials, on September 3rd, construction crews destroyed American Indian ritual and burial sites on private land in Southern Dakota. As reported by several news outlets, dozens of protesters were pepper sprayed and six people were bitten by dogs. Mass public outrage broke out as allies and news media reported the actions as police brutality and an unnecessary show of force. On September 9 2016, U.S District Judge James Boasberg rejected the Standing Rock Sioux Tribe vs. US. Army of Corps Engineers case and provided a ruling with no explanation for this decision.After this ruling thousands of people gathered at the Standing Rock Indian Reservation to protest over the Dakota Access Pipeline.Ultimately, the court ruling was a catalyst for protests to occur in the form of peaceful marches and rallies all throughout United States and globally. The NoDAPL protest is one of the largest consolidated American Indian protests in the last hundred years. 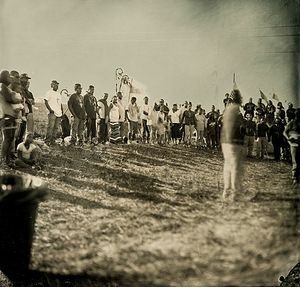 On August 24th, in a call to action update, Steve Sitting Bear, the Standing Rock Sioux Tribe’s External Director said that more than 87 tribal nations have taken action in support of his tribe’s resistance against the Dakota Access Pipeline.On October 28th, Chief Avrol Looking Horse of the Lakota, Dakota and Nakota tribes claimed over 300 flags of indigenous nations including other countries have been raised in opposition to the Dakota Access Pipeline. Several North Dakotan tribes have passed measures in support of the Standing Rock Sioux Tribe, including the Cheyenne River Sioux Tribe, Crow Creek Tribe, the Oglala Sioux Tribe, and the Rosebud Sioux Tribe. North American First Nations peoples have pledged their allegiance to the Standing Rock Sioux Tribe including the National Congress of American Indians. The Grand Folks Herald reported on October 13th, the municipal governments of 19 cities, including Seattle, St. Louis and Minneapolis, passed statutes supporting the Standing Rock Sioux in their resistance to the pipeline. On October 9th, the Morton County Sheriff’s office requested more law enforcement from neighboring states to aid with crowd control at protest sites and it’s rising neighbors. The Dane County Sheriff’s Office in Wisconsin responded, sending over ten deputies, however they were recalled a few days later due to opposition from Dane County residents and officials. Chief Arvol Looking Horse of the Lakota, Dakota, and Nakota Nations released a public statement addressing President Barack Obama and his failure to keep his word in his promises to the First Nations People of the United States of America. In his statement, Chief Arvol Looking Horse reminded President Obama that during the time of his presidential campaign he committed himself to the treaty documents signed by the United States and First Nations. Avrol implored President Obama to keep his word and answer the pleas of the Sioux Tribe and their supporters.President Obama has not responded to Chief Arvol Looking Horse. In August and early September of 2016, more and more prominent celebrities and politicians began aligning themselves with the Dakota Access Pipeline protesters. Bernie Sanders, an American politician who campaigned for the Democratic Party’s presidential nominee gave a speech to 3000 Standing Rock Sioux Tribal Members, supporters and protesters demonstrating outside of the White House castigating the Dakota Access Pipeline. Sanders vowed to stand in the fight against the “dangerous” pipeline and later released a website on his website confirming his allyship against DAPL. The Green Party’s presidential nominee, Jill Stein appeared onsite at Standing Rock protesting with demonstrators and spray painted “I approve this message” on a construction bulldozer. The Morton County Sheriff’s Department in North Dakota filed charges against the presidential candidate on the claims of vandalizing and destroying equipment. Her running mate Ajamu Baraka has also been charged with criminal trespass and criminal mischief. Neither Stein nor Baraka have disputed the claims or responded to them in any way. On September 2nd, a caravan from California with members from the Palestinian Youth-USA movement set out to Cannonball, North Dakota in support of the Standing Rock Sioux. A profound notion of these protests it that they have been able to not only draw indigenous tribes together, but also unify their support of this issue. This can be seen in the Maori, the native people of New Zealand who have shown their support by dedicating haka dances to Standing Rock Sioux Tribe. International solidarity has also been illustrated in the thousands of people around the world checking in on Facebook at Standing Rock. Allegedly, this mass check-in was organized to prevent local law enforcement from tracking protestors at Standing Rock Indian Reservation on social media. In addition, there has been a global phenomenon of trending hashtags that are illustrating solidarity against the Dakota Access Pipeline. The Dakota Access Line Protests initially did not use social media activism to launch their campaign.On April 1, 2016 over 200 Standing Sioux members on horseback initiated the first protest against construction of the pipeline beginning at the Tribal Administration Building in Cannonball, North Dakota towards the edge of the Standing Rock Reservation.After the initial weeks of the protest, Sioux members and elders reached out on social media and to other indigenous tribes requesting support. Social media and the internet are a quick and efficient way to spread information to millions of users in an instant, NoDAPL activists utilized this tool by trending on Facebook and Twitter #NoDAPL and #WaterIsLife; users could simply search the tag and find news articles regarding the Dakota Access Pipeline and the Standing Rock Sioux. More than one million Facebook users checked into Cannonball or Standing Rock, North Dakota as a means of showing solidarity and spreading awareness. Notable celebrities such as Leonardo DiCaprio and Chris Hemsworth explicitly displaying their support to millions of fans was a large way the movement was spread. Actors and politicians such as Senator Bernie Sanders who garnered a large following and media attention explicitly praised Native American efforts against the pipeline and wrote an open letter to President Obama propelled action against the pipeline. They used their platforms to spread awareness of the protests. A major success of the Standing Rock Protests is that it has become the largest unity of indigenous peoples in over a century! This is significant, as those might not be aware that indigenous groups tend to have generations of conflicts with one another. In addition, it is profound that this grass root movement has been able to capture the media’s presence to share its presence. Another achievement is the large social media following it has been able to generate and how it has been able to constantly trend throughout multiple platforms. Whereas, a shortfall of this social movement can be viewed upon the lack of active protesting in regards to how social media have allowed people to engage in merely ‘hashtag activism’. UBC professor Sarah Hunt comments on how social media has allowed impressive displays of solidarity, it does not mean that people are truly engaged in this matters or that they will continue to demonstrate their support in the future. ↑ ”Section 3: The Treaties of Fort Laramie, 1851 & 1868." North Dakota Studies. STATE HISTORICAL SOCIETY OF NORTH DAKOTA, n.d. Web. 12 Nov. 2016. <http://ndstudies.gov/gr8/content/unit-iii-waves-development-1861-1920/lesson-4-alliances-and-conflicts/topic-2-sitting-bulls-people/section-3-treaties-fort-laramie-1851-1868>. ↑ “Permit approval by the North Dakota Public Service Commission moves the Dakota Access Pipeline Project another step closer to beginning construction.” Dakota Access Pipeline. Dakota Access Pipeline, 25 Jan. 2016. Web. 12 Nov. 2016. <http://www.daplpipelinefacts.com/>. ↑ "STANDING ROCK LITIGATION FAQ." Standing Rock. Standing Rock Sioux Tribe, 30 Aug. 2016. Web. 12 Nov. 2016. <http://standingrock.org/data/upfiles/media/STANDING%20ROCK%20LITIGATION%20FAQ%20FINAL%20(1).pdf>. ↑ MOTION FOR PRELIMINARY INJUNCTION REQUEST FOR EXPEDITED HEARING. Ederal District Court in Washington, D.C. 4 Aug. 2016. Earth Justice. N.p., 4 Aug. 2016. Web. 12 Nov. 2016. <http://earthjustice.org/sites/default/files/files/Mtn-for-Preliminary-Injunction-and-Memo-in-Support.pdf>. ↑ ICTMN Staff. "Native Nations Rally in Support of Standing Rock Sioux." Indian Country Today Media Network.com. N.p., 23 Aug. 2016. Web. 12 Nov. 2016. <http://indiancountrytodaymedianetwork.com/2016/08/23/native-nations-rally-support-standing-rock-sioux-165554>. ↑ "Vision & Mission." Standing Rock. N.p., n.d. Web. 12 Nov. 2016. <http://standingrock.org/vision--mission/>. This page was last edited on 6 October 2017, at 16:33.